Ensemble Polonaise concerts are loved by all, mostly because of the variety of styles of music performed. Also, the group’s rich, Polish heritage, full of charm and history, and all-in-one-family feeling of love, warmth and fun, make their performances one of a kind experience. The instruments of the Ensemble Polonaise include violin, viola, piano and accordion. At the Ensemble Polonaise’s concerts, you will hear classical favorites, folk songs and dances from around the world, as well as popular, timeless show tunes and standards. You may experience music by Beethoven and Chopin next to a tango or a polka. All four of the very accomplished concert musicians of the Ensemble Polonaise (you can read their individual bios below) love to entertain and share their passion and joy of music with their many audiences. To learn about their concert schedule, please go to the “Concerts” page on this website. Janusz Szlubowski, a Polish pianist and accordionist performs many styles of music, from classical, easy listening jazz, ragtime, folk, international tunes (Polish, Russian, Jewish, Irish, Italian, German, French, etc.) to Dixieland and Broadway favorites. Mr. Szlubowski received his Master’s of Music in Piano Performance and Piano Pedagogy from the renowned Chopin Music Academy in Warsaw, Poland. His classical music performing has always gone hand in hand with his playing of popular music, where he has been very successful entertaining his audiences. Thanks to his warm personality, his knowledge of varied repertoire and his exquisite instrumental skills, Mr. Szlubowski has always been in demand. He has been playing both piano and accordion all his life, being able to switch between the two with great ease, energy and enthusiasm. Wherever he performs, he is always asked back repeatedly. In addition to being a member of the Ensemble Polonaise (he mostly plays accordion there), Mr. Szlubowski performs in the Szlubowski Piano Duo with his wife Danuta, who also received her Masters from Chopin Academy in Warsaw, and is currently a professor of Piano at Millsaps College in Jackson, MS. Their repertoire encompases works from Classical to Modern eras as well as some popular repertoire that everyone loves. Just like his wife, Mr. Szlubowski has many years of teaching experience in Poland, where he also spent several years working as a director of K. Kurpinski Music School in Warsaw. Mr. Szlubowski’s performing took him to Finland, where he worked for 5 years, and Germany, for two years. In Finland he performed native Finish dance music as well as all the standards. In Germany, Mr. Szlubowski performed in a quintet all the favorite repertoire including Dixieland, standards and classical music. Since 2002 he has made United States his home. Here he has performed in Tacoma, WA, Winona and Rochester, MN, Jackson, Rigdeland, Madison, MS, always leaving his listeners full of joy and excitement for his music making and warm personality. 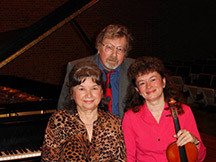 Mr. Szlubowski lives with his family in Jackson, MS.
Danuta Szlubowska, an award-winning Polish pianist and pedagog, received her Masters of Music in Piano Performance degree from the prestigious Chopin Music Academy in Warsaw, Poland. Mrs. Szlubowska and her husband Janusz Szlubowski have performed as a duo, the Szlubowski Piano Duo, at such prestigious venues as the Bartok Seminar in Budapest, Hungary; the Slupsk International Festival in Poland; the”Jeunesse Musical” Festival in Czestochowa, Poland; the Chopin Seminar and the Warsaw Autumn International Festival for Contemporary Music in Warsaw, Poland; the International Piano Seminar in Weimar, Germany; and others. In the United States she has performed at venues including the Governor’s Mansion in Olympia, WA; Peabody Conservatory of Music Concert Series in Baltimore, MD; the La Crosse Center, WI; University of Washington School of Music, Seattle, WA; Festival South in Hattiesburg, MS; as well as the Millsaps College, Hinds Community College and Belhaven University in Jackson and Raymond, Mississippi. Mrs. Szlubowska currently teaches piano at Millsaps College in Jackson, MS. She has been a sought-after pedagog for over 40 years and has achieved much success with her students. While still teaching in Poland, many of her students won awards in Europe and the United States. In addition to being part of the Ensemble Polonaise, Mrs. Szlubowska performs regularly in a Violin/Piano Duo with her daughter, Marta Szlubowska, the Mississippi Symphony Orchestra’s Concertmistress. 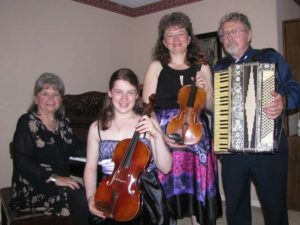 Mrs. Danuta Szlubowska and her family live in Jackson, MS.
Julia Kirk, is 15 years old and plays violin, viola and piano. In 2011 and 2012 she was selected by audition to be the Concertmistress of the All-State Invitational Orchestra held at Belhaven University in Jackson, MS. She also performs in the First Violin section of the Belhaven University Chamber Orchestra.Since 2008 Julia has been a member of the 1st Violin section of the Metropolitan Chamber Orchestra in Jackson and she will be a featured soloist with MCO in 2012/2013. Born into a Polish-American background, Julia was born in Tacoma, Washington. She began playing piano at age 3 and violin at age 5. Julia studies piano with Danuta Szlubowska (her grandmother and Millsaps College piano faculty) and violin with Song Xie (Principal 2nd Violin of MSO and the Belhaven University violin faculty). Julia has also studied violin with Mr. Vince Massimino, Ms. Rachel Jordan and Ms. Marta Szlubowska. Julia has participated in Premier Orchestral Institute, summer festival of the Mississippi Symphony Orchestra since she was 8 years old and she has often held the position of the Concertmistress. In the summer of 2012 she received scholarship and participated in the Stringwood Chamber Festival in Minnesota, where she had an opportunity to perform 6 concerts in 14 days. Julia has repeatedly received a Superior rating from the Fedaration of Music Clubs Competition in the Violin and Chamber Music categories. She has received awards on piano as well. She was the 1st Prize Winner of the G. Baliff Competition and won the 2nd Prize in the Sonatina Competition at Millsaps College in Jackson, MS. She is a recipient of the Arches to Excellence Scholarship from St. Andrew’s Episcopal School, where she will be attending 10th Grade in 2012/2013. In addition to be being one of the members of the Ensemble Polonaise, Julia performs in a duo (Duo Vivace) with her mother, Marta Szlubowska, MSO’s Concertmistress. Marta Szlubowska, you can read my bio from my Biography page in the menu to the left.